In a recent article from the May 25, 2017 issue of Nature entitled “The best-kept secrets to winning grants”, author Kendall Powell interviewed a number of experts, including our own Dr. John Robertson, who revealed their top tips and tricks for how to go about winning grants at a time when competition remains steep, particularly at the NIH. At Grant Writers’ Seminars and Workshops, we have been teaching and writing about successful grantsmanship for nearly 25 years, and the information presented in the article corroborates some of the tips and strategies that we have long espoused. 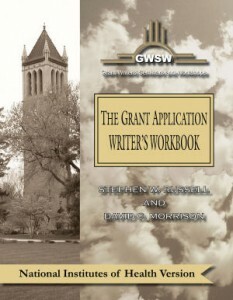 For example, one of the top ways to improve your chances of meriting funding, as outlined in The Grant Application Writer’s Workbook, is to contact a Program Officer early in the development of your proposal with your Specific Aims section (or equivalent) to get an assessment about the programmatic relevance of your idea. This is a point that is emphasized in Powell’s article. Other important advice from experts consulted for this article includes taking advantage of your Early Stage Investigator status, possibly adding a co-investigator, potentially asking for more money than a modular budget allows, and considering applying for an R01 as opposed to an R21. Successful grantsmanship is an art that can be learned, and in the current hypercompetitive funding climate, it requires that you do more than what your competitors are doing. Although this Nature article offers some helpful tips, you and/or your faculty may need or want more comprehensive advice or assistance. In the event that is the case, we’re always here to assist you through our seminars, workshops, and series of workbooks, so please don’t hesitate to reach out to us.